You may start to see fellow Hive Pass holders on various buses and Trax around town. The “I Ride with Hive” campaign has kicked off to promote and raise awareness about the Hive Pass. Current Hive Pass holders volunteered their time to be Hive Brand Ambassadors and are the focal point of the “I Ride with Hive” campaign. Six Hive Brand Ambassadors, from all walks of life, are being featured on various print ads. The idea behind the ambassador concept is to show the deeply discounted transit pass is for everyone. One of the Hive Brand Ambassadors, Liz, said “I am a full time rider for over a year now and I am loving it!”. Gary, who is one of the biggest Hive Pass enthusiasts and users, says he only has to fill up his car every two or three months because he uses the Hive Pass so much. Lastly, Karen bought a Hive Pass for her son to “teach him about being responsible to the environment by taking public transportation”. Hive Pass holders are using their discounted transit pass to meet their varying transportation needs. Whether you use it 2-3 times a week or exclusively use it as your main mode of transportation, the Hive Pass can help you meet your transportation needs. So why not Ride with Hive? Hive Passes are available now to all Salt Lake City residents. For only $42 a month, your Hive Pass includes unlimited rides on all buses, Trax, and Sugarhouse streetcar. There are discounts for Frontrunner fares as well. To obtain a Hive Pass you must bring an ID and two pieces of mail, to prove SLC residency, to one of the 3 sales locations. At that time you may purchase as many consecutive months as you would like. If you pre-purchase an entire year, an additional $29 discount is applied. After the initial in-person visit you can pay for your monthly pass over the phone, web, or still make payment in person. You may even set up automatic payments. 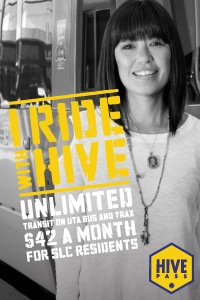 To learn more about the Hive Pass, determine your eligibility and learn how to get your pass, visit www.ridewithhive.com, e-mail ridewithhive@slcgov.com or call (801) 596-RIDE (7433).